At their maximum, the Pyro drives will provide 550MB/sec sequential read and 515MB/sec sequential write, which are similar speeds to the Kingston HyperX drives released just yesterday. Additionally, the new Patriot drives will sport the SandForce SF-2281 controller, the same one found in the OCZ Agility 3, Corsair Force Series 3 and the aforementioned Kingston HyperX. SSD enthusiasts may remember that certain Force Series 3 drives were recalled back in early June due to performance stability issues, so hopefully any related issues would have been solved before these Patriot drives reach consumer hands. 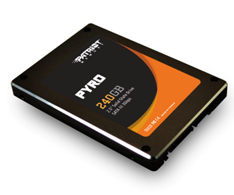 The Pyro series will come in 60GB, 120GB and 240GB capacities with TRIM support. A launch date and price were not mentioned in the press release, but thessdreview.com lists the 120GB and 240GB models for $209 and $449 MSRP, respectively. FREMONT, CALIF., USA - August 3rd, 2011 - Patriot Memory, a global pioneer in high-performance memory, NAND flash, storage, and enthusiast computer products, today expanded their new line up of SATA III solid-state drives with the launch of its new Pyro line powered by SandForce's® new SF-2281 SSD processor. The Patriot Memory Pyro series raises the bar on what's expected from performance class SSD drives delivering enterprise-like performance to consumer desktops and notebooks. The Pyro series utilizes the new SandForce® SF-2281 processor enabling it to eclipse previous mid-tier SSD performance scores with up to a blazingly-fast 550MB/s sequential read and up to 515MB/s sequential write speeds provided through a SATA 6.0 Gb/s interface. The Pyro series will feature a standard 2.5-inch form factor for compatibility with notebooks and select desktops and will ship with the latest 3.1.9 firmware. The Patriot Memory Pyro will continue to aggressively expand on what consumers can expect out of performance class solid state drives." Says William Lai, Patriot Memory's Product Manager. "With near enterprise level performance by utilizing the new SandForce® SF-2281, coupled with Patriot Memory's reputation; Pyro will deliver unmatched price per performance."